Last Ferrari F430 to be sold for charity | What Car? 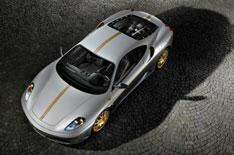 Ferrari has announced that the final F430 model built will be auctioned for charity. Money raised will go towards rebuilding work in the Abruzzo region in Italy, which was devastated by an earthquake on April 6, 2009. The car will have special two-tone paintwork that represents the traditional colours of Aquila, the city hardest hit by the earthquake. It will also come with a certificate signed by Ferrari chairman Luca di Montezemolo, and a personalised dedication plate to commemorate the donation. The auction will take place on Sunday, May 17 and the car will be the final F430 to roll off the production line towards the end of 2009. The F430's replacement expected be called the F450 is due to be unveiled later this year.